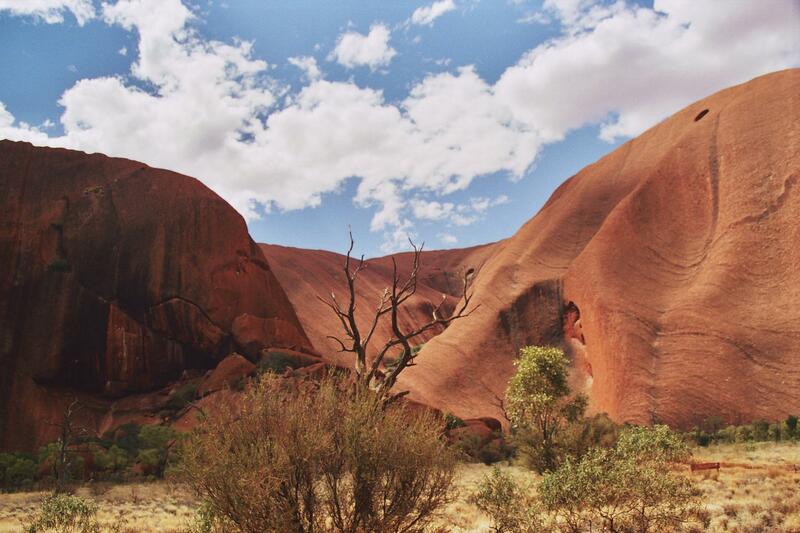 Uluru / Ayer's Rock	Photo © Ariel G! Uluru-Kata Tjuta National Park is home to Australia’s most iconic natural landmark. Uluru (or Ayers Rock) is a world-famous monolith that rises up out of the surrounding red desert in the Northern Territory. The enormous sandstone rock is 1,142 feet tall, which is higher than the Eiffel Tower or Chrysler Building. Most of its volume, however, is located below the ground. The national park also contains Kata Tjuta (or The Olgas), which means ‘many heads’ and is a series of smaller sandstone rocks located nearby. 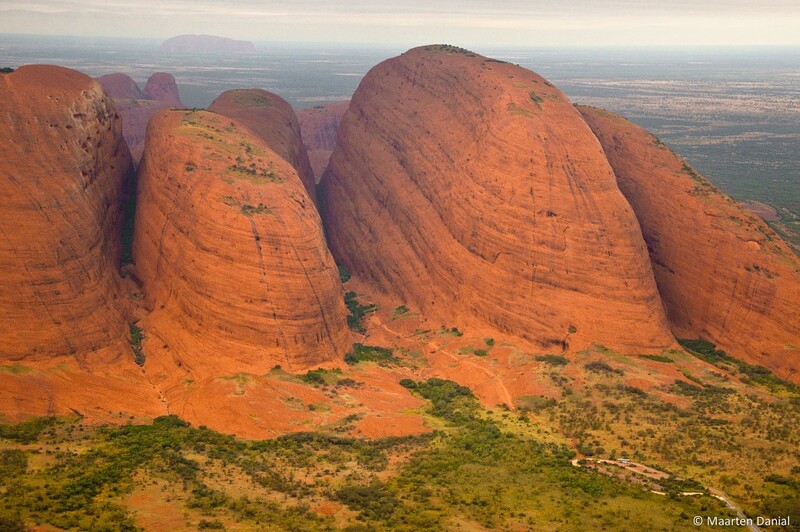 The highest rock in Kata Tjuta is actually a lot higher than Uluru, rising 1,791 feet above the plain. At only 43 miles wide, this is one of the smaller, yet most significant, national parks in Australia. 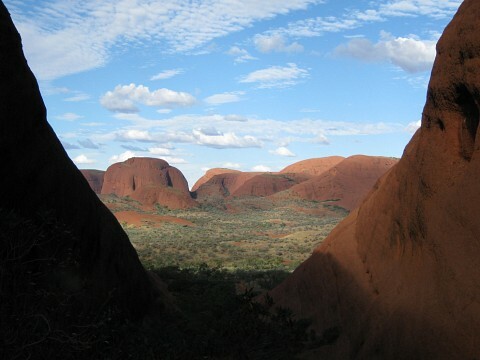 The spectacular rocks of Uluru and Kata Tjuta are the park’s main attractions. 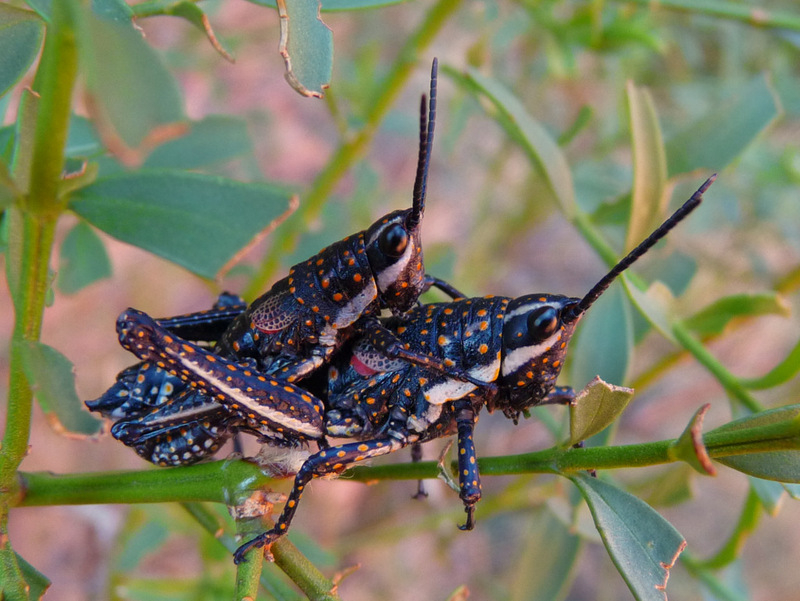 Their presence is even more striking because of the flat surrounding, sand plains of Central Australia. 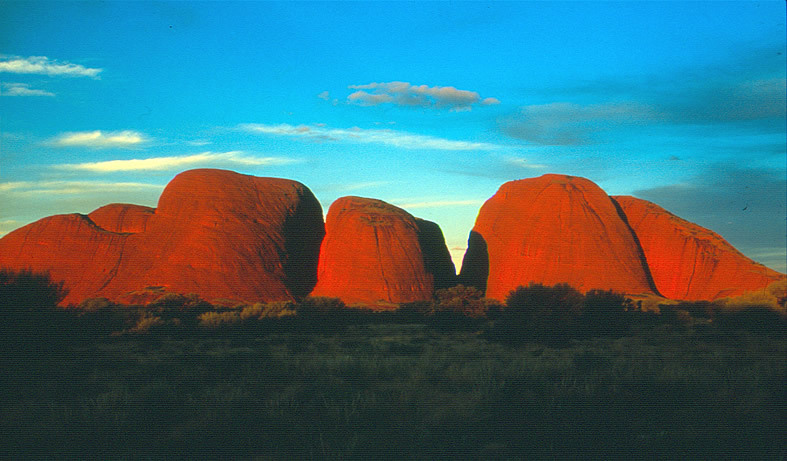 The rocks play a central role in the beliefs and legends of the Aboriginals, probably the world’s oldest surviving human society. The importance of these sites can’t be exaggerated. Uluru-Kata Tjuta National Park lies about 280 miles southwest of Alice Springs, which is the nearest town of decent size. The nearest town to the north is Darwin, at a little less than 932 miles. It is incredibly remote and the Red Center can be reached along the Lasseter and Stuart Highways. The national park has a desert climate and environment. However, it is home to a surprisingly high number of plants and animals. More than 400 plants can be found in the park, most of them important to the Aboriginal peoples as a food source, medicine, or fuel. Animal life consists mostly of birds and reptiles, although several mammal species can be seen as well. Wallabies, Lizards, Snakes, Red Kangaroos, Emus, Camels, and Dingoes are some of the high-profile animals that can be spotted. According to archaeological finds, the Central Australian desert regions have be occupied by humans for more than 30,000 years. 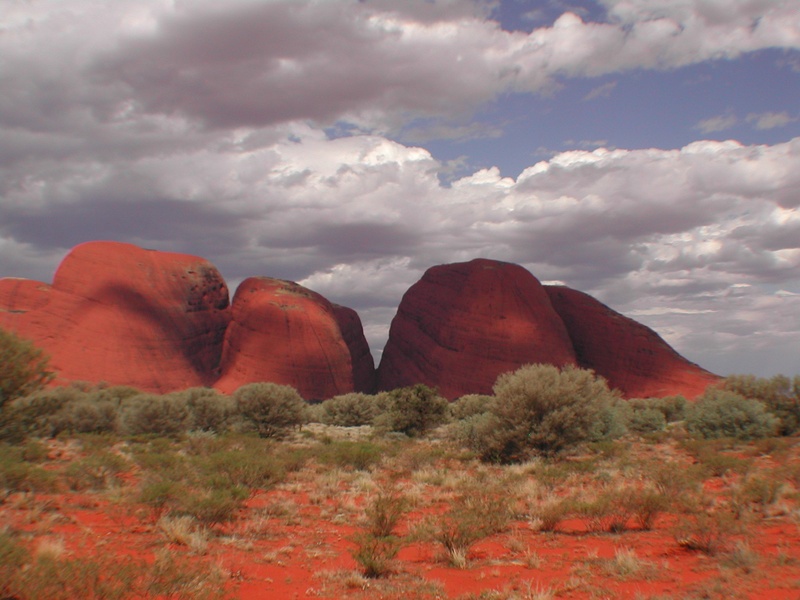 The Anangu people are the traditional owners of the landscape. They believe that Uluru and Kata Tjuta are remnants of the actions of ancestral beings during the Dreamtime (the time of creation). The first Europeans arrived in the 1870s. William Giles and William Gosse, both members of separate expeditions, were the first Europeans to explore and survey the area. Giles saw Kata Tjuta first and named it Mount Olga; Gosse spotted Uluru and named it Ayers Rock, after the Chief Secretary of South Australia. During the last decades of the 19th century, pastoralists moved into the area, resulting in competition for food and other resources and eventually in violent clashes between the colonists and Aboriginals. From 1918 to 1921, huge areas of South Australia, Western Australia and Northern Territory became Aboriginal reserves, essentially a place for Aborigines that had no contact with white people. The first visitors went to Uluru in 1936, and the area became a UNESCO World Heritage Site in 1987 for its natural landscapes. In 1994, it became only the second in the world to be dual-listed on the UNESCO list; it was added on the list of culturally significant places as well. 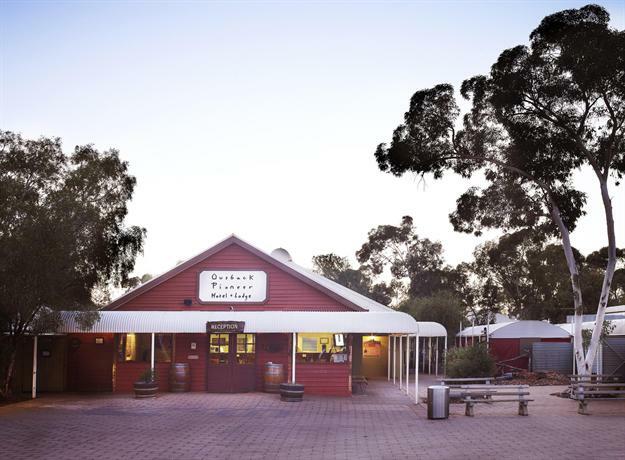 The first place to visit is the Cultural Center, where visitors can learn about the Anangu culture. Exhibitions include Anangu art, Anangu stories, and history. Visitor guides can be purchased at the Cultural Center as well. A popular activity is walking around the base of Uluru. 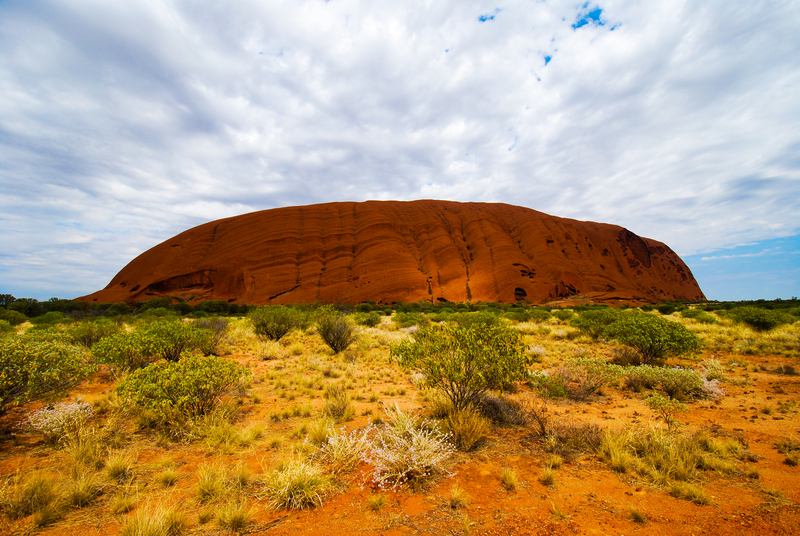 It is a 10.6-kilometer loop close to the rock, which allows hikers to discover the various textures and colors of Uluru and see native plants and wildlife. 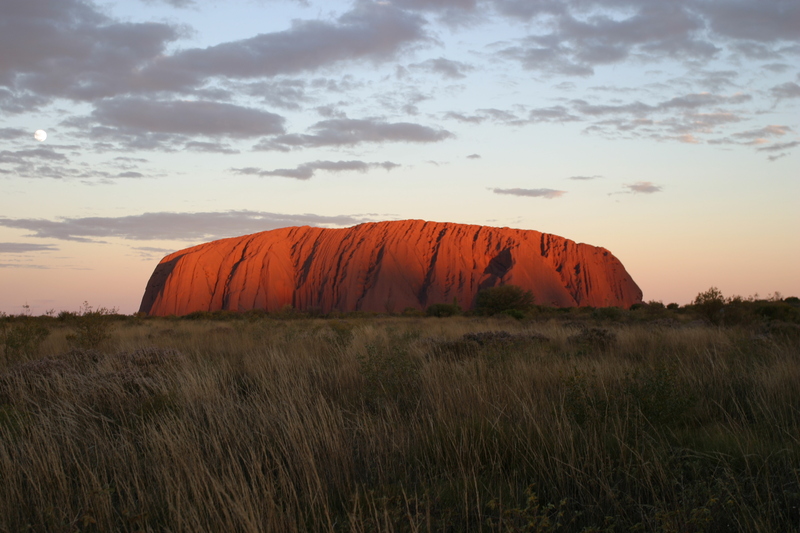 Climbing Uluru is possible too, but it is suggested not to, as it is a sacred place to the Aboriginals. A real highlight of a visit to Uluru-Kata Tjuta National Park is watching the sunrise over Uluru. As the run rises, the colors of the rock and landscape change dramatically, an experience that is breathtaking. Sunsets are spectacular as well. There are two designated viewing areas for sunrises and sunsets. Besides walking around the base of Uluru, there are several other short hiking trails in the national park. In particular, the Kuniya Walk to the Mutitjulu Waterhole (near Uluru), and the Walpa Gorge Walk, Kata Tjuta Dune Walk, and Valley of the Winds Walk (both in near Kata Tjuta) are excellent ways to explore more of the area. Uluru-Kata Tjuta National Park can be reached by car and plane. There are daily flights to Ayers Rock Airport in Yulara via Alice Springs from major cities in Australia. The Red Center is reached by car on the Red Center Way, a remote desert highway. From Alice Springs it still is a four-and-a-half-hour drive to Uluru. Other rocky desert parks in Australia are Purnululu National Park, Flinders Ranges National Park, and Mount Augustus National Park.